Goaltender Sinead Murphy ’12 has stopped 62 of 63 shots in her past two starts. “Conn was a tough team that played hard, so it was nice to end January on two big wins,” tri-captain Emily Vitale ’12 said. The Jeffs got started on Friday night by taking the Camels 3-2, snapping their six-game winning streak in the process. Minutes into the game, Geneva Lloyd ’13 took advantage of an early power play opportunity, with Josie Fisher ’12 and Ellen Swiontkowski ’12 picking up the assists. Conn. College immediately tied things up when Olivia Farrell answered less than a minute later. Lloyd went back to work during another power play, notching her second goal of the game and putting Amherst up 2-1. At 14:22 in the second period, Kaitlyn McInnis ’13 fed Swiontkowski, who bested Camels goalie Amy Leichliter to score Amherst’s third and eventual game-winning goal. While Conn. tried to mount a comeback in the third period, scoring two minutes into the stanza to put her team within one, Amherst’s defense shut the door to preserve the victory. Stuart, in net, made 20 saves and improved to 7-1. “Everything that we do starts with team defense. That starts with goaltending, and we’ve had exceptional goaltending all season,” head coach Jim Plumer said. 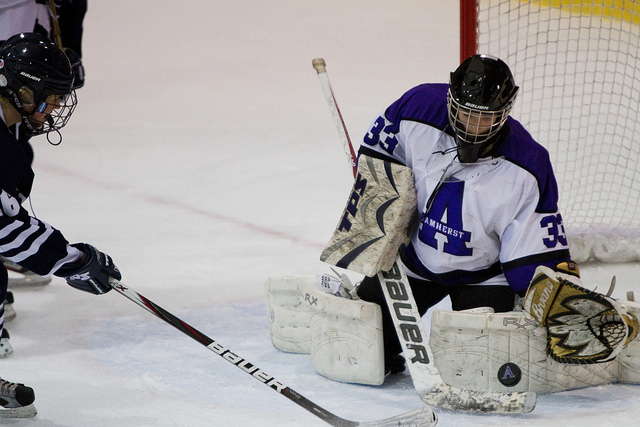 Amherst went back to work on Saturday, defeating Conn. College 2-1. McInnis lit it up late in the first period, putting Amherst on the scoreboard with an unassisted goal, her first of the season. After the break, Amherst profited from a two-man advantage as Melissa Martin ’15 netted a power-play goal. Conn. College put one on the board in the third and pulled their goalie late in the game for the second time in as many games, but Amherst’s defense denied them again. Sinead Murphy had 32 saves on the day, improved to 8-2, and was named NESCAC Co-Player of the Week after an impressive weekend. The Jeffs’ winning weekend, coupled with Middlebury’s 2-1 loss at Hamilton, opens the door for Amherst to capture the top seed in the NESCAC. The Panthers (10-2 NESCAC) have earned more points than the Jeffs (9-1 NESCAC), but Amherst currently holds a higher winning percentage (.900 to .833). Amherst will travel to Williams (5-5-0 NESCAC) for a pair of games this upcoming weekend. In last year’s doubleheader against the Ephs, the Jeffs outscored Williams by a ridiculous 17-4 margin. The Jeffs have dominated the rivalry in recent years, having won the last 10 matchups in the series; Amherst has not lost to Williams since December 2006.